Home News Tablets Android Captures Record 41 Percent Share of Global Tablet Shipments in Q3 2012! 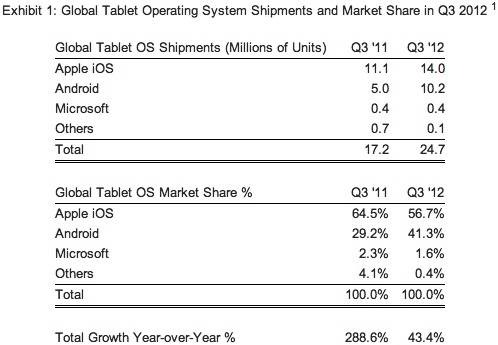 Android Captures Record 41 Percent Share of Global Tablet Shipments in Q3 2012! According to the latest research from Strategy Analytics, global tablet shipments reached 25 million units in the third quarter of 2012. Apple iOS slipped to 57 percent global market share, allowing Android to capture a record 41 percent share. More details after the jump. Peter King, Director at Strategy Analytics, said, "Global tablet shipments reached 24.7 million units in Q3 2012, rising a sluggish 43 percent from 17.2 million in Q3 2011. Demand for tablets slowed due to ongoing economic uncertainty and consumers holding off purchases in anticipation of multiple new models, like the iPad Mini, during the upcoming Q4 holiday season. Apple shipped a disappointing 14.0 million iPads worldwide and captured 57 percent share in the third quarter of 2012, dipping from 64 percent a year ago. Apple's slowdown allowed the Android community to make gains and Android's global share of the tablet market now stands at a record 41 percent." Neil Mawston, Executive Director at Strategy Analytics, added, "Android captured a record 41 percent share of global tablet shipments in Q3 2012, jumping from 29 percent a year earlier. Global Android tablet shipments doubled annually to 10.2 million units. No single Android vendor comes close to Apple in volume terms at the moment, but the collective weight of dozens of hardware partners, such as Asus, Samsung and Nook, is helping Google's Android platform to register a growing presence in tablets." 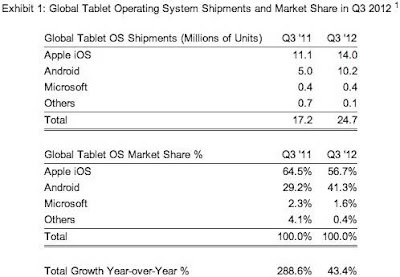 * Microsoft captured a niche 2 percent global tablet share in Q3 2012. The imminent release of the new Windows 8 operating system will likely drive Microsoft tablet volumes higher during the Q4 2012 holiday season. The full report, Global Tablet OS Market Share: Q3 2012, is published by the Strategy Analytics Tablet & Touchscreen (TTS) service, details of which can be found here: http://tinyurl.com/bpqpnbs.